Posts are limited this week and next — partly because a draft of a document about “exotic” Higgs particle decays (which I wrote about here, here, here, here and here), relevant to how the Large Hadron Collider experiments ATLAS and CMS might collect their data in 2012 (in particular, how they might trigger on such decays), needs to get done right away. (Data’s already coming in! we’re later than I’d like.) And it really has to get done now since I’m traveling next week with limited internet. Meantime, a reminder in case you missed it: For those of you in the New York City area: I’ll be joined by the wonderfully talented singer-songwriter-pianist Andrea Wittgens in giving a physics/music joint performance/presentation at the storied Cornelia Street Cafe, Sunday May 13th at 6 p.m., as part of their Entertaining Science series. It’s entitled Rhapsody for Piano and Universe, and intended for the general public. The place is pretty small, so get reservations in advance by calling 212.989.9319.
Who hasn’t heard of Einstein? We all know Einstein failed eighth grade math. (Although he didn’t.) We know he showed energy is the same thing as mass (or was it “matter”? ), that he’s the father of the atomic bomb, that he was an old man with frizzy hair, and that he was a patent clerk whose theory was that everything is relative and that nothing can move faster than light. This messy assortment of half-truths and misconceptions permeates our culture and affects public perceptions of science, at many different levels. In this talk we’ll consider how our culture’s obsession with Einstein impacts efforts to convey science to the public. This entry was posted in LHC News, Public Outreach and tagged ExoticDecays, Higgs, LHC, PublicTalks. Bookmark the permalink. Talking about giving a physics/music joint performance/presentation, here is one of my favorites. I hope you don’t mind me sharing it with your readers. Which languages did Einstein speak and read? My understanding is that he spoke almost no English before leaving Germany in 1933 and that he was somewhat fluent in French and Italian. Is this correct? Could he read Russian? Ahhhh! I’ll be right across the bridge in NJ on Saturday for a big event. But I have to go to Pittsburgh for Mother’s Day on Sunday. I wish I could stay for that presentation. Sounds like it would be awesome! 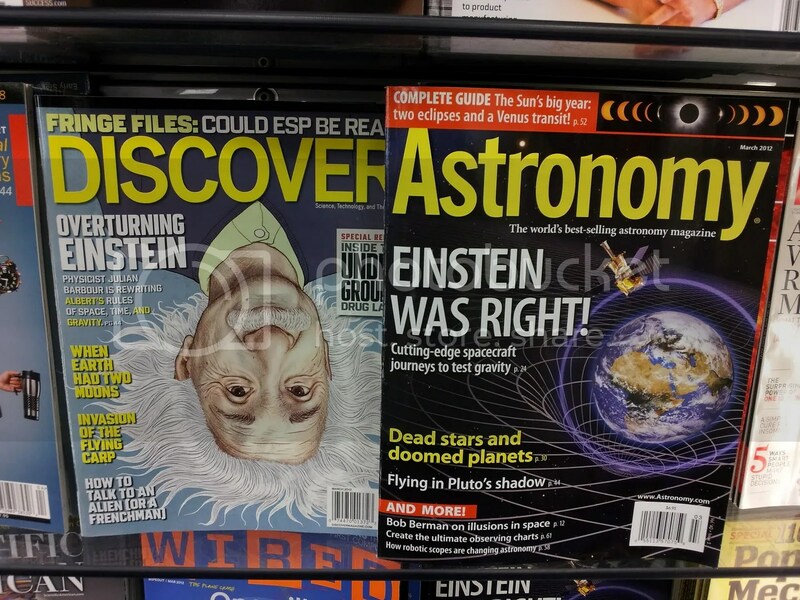 Prof. Strassler: Why, in your opinion, is our culture obsessed with Einstein? Is J. Christian of Oxford the greatest theoretical physicist since *******? I claim that Christian’s parallelized 7-sphere model HAS ALREADY BEEN EMPIRICALLY CONFIRMED. The Rañada-Milgrom effect is that the -1/2 in the standard form of Einstein’s field equations should be replaced by -1/2 + dark-matter-compensation-constant, where this constant is approximately sqrt((60±10)/4) * 10^-5 . THERE IS OVERWHELMING EMPIRICAL EVIDENCE FOR THIS from the work of Milgrom, McGaugh, and Kroupa. Seiberg-Witten M-theory cannot explain this. However, Christian’s theory or modified M-theory with Wolfram’s automaton CAN EXPLAIN the Rañada-Milgrom effect. If nature is infinite, CHRISTIAN’S THEORY is the only way to explain the Rañada-Milgrom effect. If nature is finite, then Fredkin-Wolfram-Brown theory REQUIRES the approximate validity of Christian’s theory. Therefore, Christian’s theory of local realism is empirically valid BECAUSE the Rañada-Milgrom effect is empirically valid. David, I don’t mean this as a challenge and won’t have any follow-up comment beyond this, but I’m curious what your background in physics is. Did you study physics at the undergraduate or graduate level or are you self-taught? Also, are there other people outside the internet with whom you discuss your ideas about physics? Again, let me stress that I don’t mean these questions rhetorically as an argument against your views (e.g. a self-taught hermit could at least in principle still know a lot about physics). Being on the wrong side of the pond I’ll be unable to attend this event but it does strike me as an interesting topic for discussion. I hope it goes well. Thanks for your site- it’s a great resource. Oh! Fantastic! May I have your permission to use it in my talk? Absolutely! Just credit me with the snap. How big is a barn? Take a centimeter; now take a trillionth of a centimeter; now take a square whose sides are a trillionth of a centimeter. The area of that square is a barn. More physically, the cross-sectional area of a proton is about a tenth of a barn. There’s something funny about the numbers appearing on the LHC webpage. Collision rates aren’t 10 per femtobarn per hour. It will be 20 per femtobarn all year. Sounds like an interesting talk. Will it be posted online? Thanks. It can’t really be posted. But we’ll do it again.